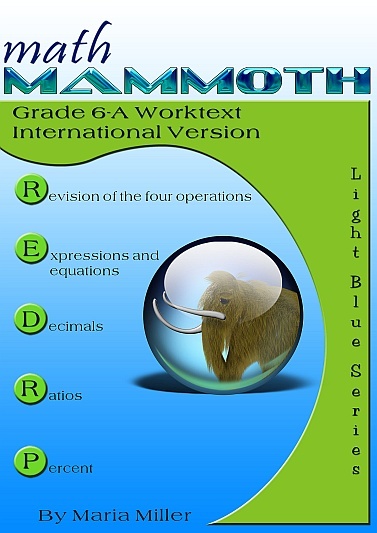 Math Mammoth Grade 6 International Version - description, samples, and purchase info. Math Mammoth Grade 6 International Version is a complete maths program for sixth grade. It consists of two student worktexts (A and B), a separate answer key for each, tests, mixed revisions, and in the download version, an additional worksheet maker (Internet access required) to make extra practice worksheets when needed. You can purchase printed hardcopies at Lulu. The prices below are in USD. The curriculum teaches the metric measurement units. Imperial units, such as inches and pounds, are not used. The spelling conforms to British international standards (British English). Page (paper) size is A4. In money-related word problems, the symbol it uses is "$" (dollar). In sixth year, students encounter the beginnings of algebra, algebraic expressions, one-variable equations and inequalities, integers and ratios. We also revise and deepen the students' understanding of rational numbers: both fractions and decimals are studied in depth, while percent is a new topic for 6th year. In geometry, students learn to compute the area of various polygons, and also calculate volume and surface area of various solids. The last major area of study is statistics, where students learn to summarise and describe distributions using both measures of centre and variability. The year starts out with a revision of the four operations with whole numbers (including long division), place value and rounding. Students are also introduced to exponents and they do some problem solving. Chapter 2 starts the study of algebra topics, delving first into expressions and equations. Students practise writing expressions in many different ways, and use properties of operations and the idea of maintaining the equality of both sides of an equation to solve simple one-step equations. We also briefly study inequalities and using two variables. Chapter 3 has to do with decimals. This is a long chapter, as we revise all of decimal arithmetic, just using more decimal digits than in 5th year. Students also convert measuring units in this chapter. Ratios is a new topic (chapter 4). Students are already familiar with finding fractional parts from earlier years, and now it is time to advance that knowledge into the study of ratios, which arise from dividing a quantity into many equal parts. We study such topics as rates, unit rates, equivalent ratios and problem solving using bar models. Percent (chapter 5) is an important topic to understand thoroughly, because of its many applications in real life. The goal of this chapter is to develop a basic understanding of percent, to see percentages as decimals and to learn to calculate discounts. Chapter 6 first revises prime factorisation and then applies those principles to using the greatest common factor to simplify fractions and the least common multiple to find common denominators. After a thorough revision of the fraction operations from fifth year (addition, subtraction and multiplication), Chapter 7, Fractions, then focuses on the new topic for sixth year: the division of fractions. The chapter also includes ample practise in solving problems with fractions. The next chapter, Geometry, focuses on calculating the area of polygons. After a brief revision of terminology for triangles and quadrilaterals and drawing fundamentals, this new topic is presented simply in a logical progression: first, the area of a right triangle; next, the area of a parallelogram; then, the area of any triangle; and finally, the area of a polygon. The chapter then expands the concepts learned into developing nets for simple solids to calculate their surface area and to figuring the volume of rectangular prisms with edges of fractional length. The final chapter is about statistics. Beginning with the concept of a statistical distribution, students learn about measures of centre and measures of variability. They also learn how to make dot plots, histograms, boxplots, and stem-and-leaf plots as ways to summarise and analyse distributions. Please also see the table of contents for 6-A and 6-B (in the sample), which will let you see the topics covered in more detail. BONUS! With the download version, you will also get Soft-Pak programs completely FREE. The 6 programs in Soft-Pak (4 math, 1 language arts, 1 list maker) offer both on-screen and printable activities in a low-graphic, high content format. Read more and see screenshots. Review: Math Mammoth International Light Blue — a review by Annette V at A Net in Time blog. On this site (Mathmammoth.com) — using the "Add to cart" buttons. By purchasing any of the books, permission IS granted for the purchaser (teacher or parent) to reproduce this material to be used with his/her students in a teaching situation; not for commercial resale. Please note: you are not permitted to share the material with other teachers or parents.